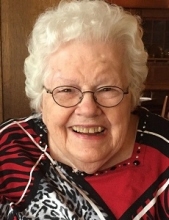 Donna M. Way, 91, born November 9, 1927 in Holland, MI, daughter of Henry and Theresa (Seif) Wieten, passed away on January 23, 2019 in Grand Rapids, MI. She was a devoted, selfless wife and mother; a strong woman who survived TB and two brain aneurysms; all with grace and a joyful heart. Donna was a wonderful homemaker who loved to cook, garden, can, sew, knit, and cross-stitch. She later shared the joy of books with children as Wacousta Elementary librarian. Donna was an avid MSU fan, enjoyed traveling, and above all, loved her family. The family would like to thank the staff in Ritzema Hall at the Edison Christian Life Services and Faith Hospice for their loving care of Donna. Donna is survived by her three sons: James (Kathy), Steven (Cindy), Scott (Debbie), three daughters: Janice (Rod) Lawrence, Barbara (Scott) Sitler, Judy (Michael) Birkmeier; 18 grandchildren, 11 great grandchildren; sister Barbara (Frank) VanderMoere; brothers Kenneth (Barbara) Wieten and Henry (Mari) Wieten. She was preceded in death by her husband of 60 years, Richard Way, and sisters: Shirley Sutter and Ardella Young. To send flowers or a remembrance gift to the family of Donna M. Way, please visit our Tribute Store. "Email Address" would like to share the life celebration of Donna M. Way. Click on the "link" to go to share a favorite memory or leave a condolence message for the family.